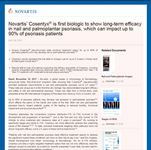 Basel, November 30, 2017 - Novartis, a global leader in Immunology & Dermatology, announced today first-of-its-kind long-term data showing that Cosentyx® (secukinumab) provided sustained improvements in nail and palmoplantar psoriasis out to 2.5 years,. These data are unique as it is the first time any biologic has demonstrated long-term efficacy and safety in nail and palmoplantar psoriasis. These new data from a clinical study were presented at the 8th International Congress of Psoriasis from Gene to Clinic in London, UK. Up to 90% of psoriasis patients may develop nail psoriasis or palmoplantar psoriasis,, which affects the palms of the hands and soles of the feet. Both nail and palmoplantar psoriasis heavily impact patients' quality of life leading to reduced mobility, functional impairment and physical discomfort-. Cosentyx addresses the cornerstone cytokine interleukin-17A (IL-17A) involved in the development and progression of psoriasis, and is the first and only fully human IL-17A inhibitor to show sustained skin clearance rates at 5 years in psoriasis. By working to specifically target and inhibit IL-17A, Cosentyx can more effectively address the underlying cause of the disease-. To date, psoriasis treatments targeting other, less direct, pathways have not shown long-term efficacy out to 2.5 years in these hard-to-treat forms-. "Patients with nail and palmoplantar psoriasis need effective treatment options to address the significant impact these conditions can have on their day-to-day lives," said Eric Hughes, Global Development Unit Head, Immunology & Dermatology. "As an IL-17A inhibitor, Cosentyx provides a highly targeted treatment option that can not only effectively treat the plaques caused by psoriasis, as evident by recently presented 5-year data, but also hard-to-treat forms and associated arthritic conditions." In GESTURE, 59% and 53% palmoplantar psoriasis patients who received Cosentyx 300 mg and 150 mg respectively achieved clear or almost clear palms and soles at 2.5 years (as measured by Palmoplantar Investigator's Global Assessment (ppIGA) 0/1). In the TRANSFIGURE study, patients with nail psoriasis who were treated with Cosentyx 300 mg and 150 mg showed a substantial NAPSI (Nail Psoriasis Severity Index) improvement from baseline of -73% and -63% respectively. GESTURE, the largest and longest randomized controlled trial to date in palmoplantar psoriasis patients, and TRANSFIGURE, the first large, controlled trial to report long-term results in nail psoriasis, both demonstrated strong sustainability out to 2.5 years,, with a favorable and consistent safety profile,,-, including close to zero injection site reactions or associated pain,. Cosentyx, launched in 2015, is the first and only fully human IL-17A inhibitor approved to treat psoriasis, psoriatic arthritis (PsA) and ankylosing spondylitis (AS). Cosentyx is a targeted treatment that specifically inhibits the IL-17A cytokine which plays a significant role in the pathogenesis of plaque psoriasis, PsA and AS,. Cosentyx is also approved for the most hard-to-treat forms of plaque psoriasis - palmoplantar psoriasis (psoriasis of the palms of the hands and soles of the feet), nail psoriasis and scalp psoriasis. To date, more than 125,000 patients worldwide have been prescribed Cosentyx in the post-marketing setting across all indications. GESTURE is the largest and longest duration randomized, placebo-controlled trial to date to investigate the safety and efficacy of Cosentyx 150 mg and 300 mg subcutaneous with moderate-to-severe palmoplantar psoriasis. The effect of Cosentyx treatment on palm and sole skin clearance was determined using the Palmoplantar Investigator's Global Assessment (ppIGA) and Palmoplantar Psoriasis Area and Severity Index (ppPASI). Positive impact on quality of life was assessed via the Dermatology Life Quality Index (DLQI) and palmoplantar Quality of Life Instrument (ppQLI) scores. The results from 205 patients who participated in the study showed that 59% and 53% of patients who received Cosentyx 300 mg and 150 mg respectively achieved clear or almost clear palms and soles at 2.5 years, as measured by ppIGA. Consistent benefits were seen in changes in ppPASI score, an important measure of treatment success, and quality of life enhancements derived from marked improvements in pain and function of palms and soles. The safety profile of Cosentyx was shown to be consistent with that seen in clinical trials across multiple indications,,-. TRANSFIGURE is the first large, double-blind, randomized, placebo-controlled Phase IIIb study to investigate the long-term safety and efficacy of a biologic in moderate-to-severe nail psoriasis. TRANSFIGURE investigated the superiority of two dosing regimens of Cosentyx (150 mg and 300 mg subcutaneous) versus placebo, with clinical effect assessed at 2.5 years using the Nail Psoriasis Severity Index (NAPSI) and Psoriasis Area and Severity Index (PASI). Impact on quality of life was measured using the Nail Assessment in Psoriasis and Psoriatic Arthritis (NAPPA) and EuroQOL 5-Dimension Health Status Questionnaire (EQ-5D). The results from the 198 patients who participated in the study showed a substantial NAPSI improvement from baseline of -73% and -63% in patients who received Cosentyx 300 mg and 150 mg respectively, which was sustained out to 2.5 years. Similarly, sustained improvements in the scores from NAPPA and the EQ-5D highlighted the quality of life benefits received from treatment, with patients reporting decreased pain and discomfort. The safety profile of Cosentyx was shown to be consistent with that seen in clinical trials across multiple indications,,-. Psoriasis is a common, non-contagious, autoimmune disease that affects more than 125 million people worldwide. Plaque psoriasis is the most common form of the disease and appears as raised, red patches covered with a silvery white buildup of dead skin cells. Palmoplantar psoriasis, which appears on the palms of the hands and soles of the feet, occurs in up to 40% of plaque psoriasis patients and is frequently resistant to treatment,. Novartis is a global leader in Immunology & Dermatology. We are transforming the lives of people living with immunologic diseases, focusing on specialty dermatology, rheumatology, auto-inflammatory, transplant and specialty liver diseases where high unmet medical needs exist. Our leading brand Cosentyx® (secukinumab) is an innovative biologic approved in more than 70 markets for the treatment of moderate-to-severe psoriasis (PsO), ankylosing spondylitis (AS) and psoriatic arthritis (PsA). Other key brands include Xolair® (omalizumab)* in chronic spontaneous urticaria (CSU), Zortress®/Certican® and Myfortic® in transplant and Ilaris® (canakinumab), approved to treat several rare diseases including some Periodic Fever Syndromes. Our I&D pipeline includes multiple compounds in liver disease. *In the US, Novartis Pharmaceuticals Corporation and Genentech, Inc. work together to develop and co-promote Xolair. Zeichner JA and Armstrong A. The role of IL-17 in the pathogenesis and treatment of psoriasis. J Clin Aesthet Dermatol. 2016;9:S3-S6. Mease PJ and Armstrong AW. Managing patients with psoriatic disease: the diagnosis and pharmacologic treatment of psoriatic arthritis in patients with psoriasis. Drugs. 2014; 74:423-41.